The harbour of Barentsburg may be in need of some repair (work in process), but it used to have a great advantage during the 20th century compared to Longyearbyen and Pyramiden: the fjord, Grønfjord, freezes later and the ice breaks up earlier, so the shipping season was significantly longer. Early in the 20th century, ships could go alongside in the harbour or not far away at the ice edge in spring or in the early summer, while provisions and passengers with destination Longyearbyen had to wait for weeks or face a transfer of sometimes 30-40 kilometres across the ice of Isfjord. Which was not frozen every year in the early 20th century either, but it was not uncommon. If we get to see that again now? That seems rather doubtful in the light (or, rather, shadow) of climate change, which also means Barentsburg has largely lost this strategical advantage in comparison to Longyearbyen. The old harbour office building has been empty for many years now. 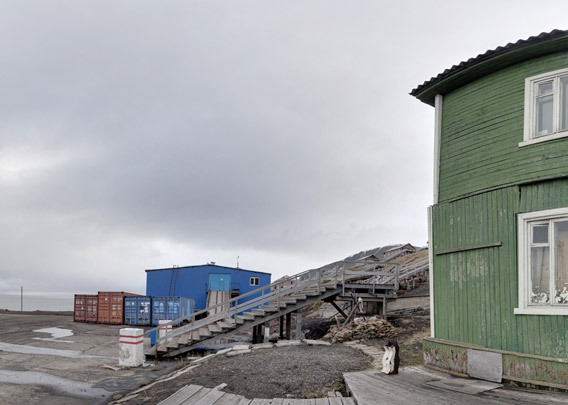 But the sign “Barentsburg”, the old, solid mine telephone (impossible to break, but only for local connections) and the garbage bin in shape of a penguin (otherwise quite rare in the Arctic) are nevertheless popular photo motives for visitors.